Many folks shopping for cookware balk at the high prices commanded by the All-Clad line. Chefs and cooking professionals don't, because we understand the value of a top quality tool. For me, a fry pan that won't let me down is worth its weight in gold. Otherwise known as a skillet, this is the pan that gets the most use in my kitchen. 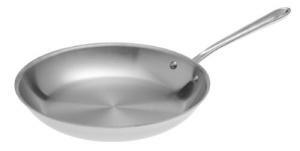 The pots and pans in the All-Clad line are manufactured in a unique way that bonds multiple layers of heavy stainless steel with a thick aluminum core. This results in a pan with exceptional heat dispersing qualities throughout. That means you can do your cooking with greater control and less heat. The stainless steel interior has no nonstick coating applied. The highly polished surface is naturally resistant to sticking, and as long as you follow the instructions for use you will find that it performs as well as any coated pan, and last much longer. These pans carry a lifetime warranty against defects. This fry pan, like the others in the line, has a magnetic steel exterior that is said to perform equally well on an induction cooktop as well as any standard burner. The weight provides good balance during use and the extra long handle stays cool to the touch. Keep in mind, this cookware requires a bit more care than some. You must pay attention to the cooking temperature and keep the heat lower than you might be used to. Also, if the interior becomes stained or coated from foods cooked at too high a heat it will affect the stick-resistance and need to be cleaned thoroughly to bring back the polished finish. These pans are manufactured right here in America, at the All-Clad plant in Pennsylvania. So you can call the purchase an economy booster as well as an investment in your own cookware account. Compare this with the All-Clad Stainless Steel French Skillet.